I work 40 hours a week in the shop or coaching here at Westridge Golf Centre, and on top of that I practice working to improve my own game in the free time that I have available. Whilst working or practising, I see lots of members and non-members come up to hit balls on the driving range to work on their swing, trying to get themselves hitting the ball better in preparation for next week’s skins match amongst their mates, or the club monthly medal. It’s all very good hitting 150 balls on the range twice a week, and saying that you have put lots of work hard work into to improving your game…….but have you??? This is where the phrase “deliberate practice” comes into the conversation. This term was used by psychologist K. Anders Ericsson where his research talks about how humans achieve mastery in a certain skill. In relation to golf, deliberate practice is about improving by pushing your practice beyond your comfort zone. This doesn’t mean just turning up at the range and smashing loads of balls in the hope that you might just start hitting the ball better! Only by practising with purpose and a bit of pain will you improve. I’m now 29 and have been a Professional for 7 years and have won 4 events in this time, but my last victory was 3 years ago. Over this time I have realised what separates me and everybody else from world-class performers is how they approach every day trying to get better! My practice sessions were pathetic, I would get a bucket of balls and start with a short iron working my way up to the driver, not trying to accomplish anything but figure out why the good shots were good and the bad shots were bad! I would have my reasons as to why these were happening, and how I would go about trying to replicate the good shots and eliminate the bad without having any real evidence to support my theories. Soon 1 hour passes by, I had run out of balls and I wouldn’t have achieved anything during the session. This is when I realised that something had to change during my practice in order for me to get better! I analysed my game and now practice specific things in order for me to improve. When you practice, you need to work on things that are unique to you. Don’t get fooled into trying the latest tip that you read in a golf magazine or see on the internet! You need a personalised plan that stretches you out from your comfort zone. Only you and your coach (If you have one) will know what this is. So when you next go up the range to practice ask yourself, what shots and situations on the golf course make you uncomfortable? What would you like to do well on the golf course? Once you have figured these out, devise a plan to practice specifically on those areas. These can be anything from trying to get the ball closer from 120 yards away, to driving it straighter, or just hitting punch shots with a 7iron in order to control your ball flight for windy conditions. 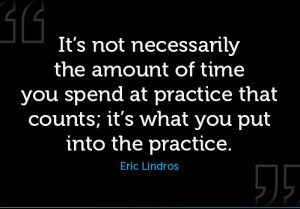 But remember the practice is specific to what you want to achieve in order for your game to improve! Don’t get frustrated if you’re hitting a lot of bad shots during the practice session, this is a good sign your achieving deliberate practice and not just falling back into old habits and achieving nothing! When trying to get better sometimes you have to take 1 step backwards in order to take two steps forward as they say.